Talking Ed Note: Not entirely dissimilar to the yellow school buses in New Orleans these new yellow cabs on 14th Street had nowhere to go in Hoboken and are likely ruined. On another note, power in Hoboken continues to be an issue in many areas but the county and State both have challenges on that front. Jersey City reported to have a 70% outage. Hoboken Patch says its unclear when and if the NJ National Guard may come to Hoboken. 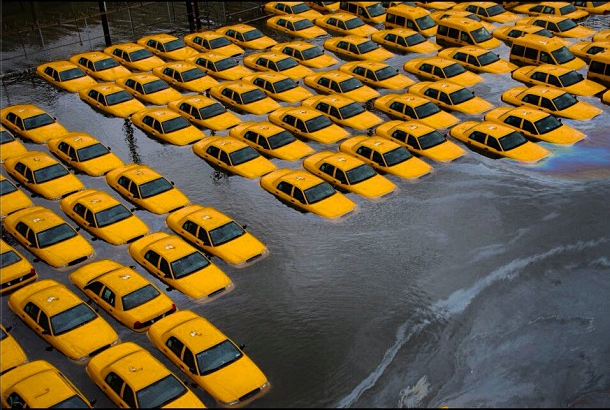 Based on the devastation throughout New Jersey, the demand must be extraordinary.